StellrScope , a major artwork of the *Centenary of Canberra Science Art Commission, supported by the Australian Capital Territory (ACT) Government and the Australian Government, explores the story connecting the Canberra region to Australia’s major wheat crop, from the times of William Farrer through to current science research at CSIRO. To complete the project, a residency was awarded to Dr Eleanor Gates-Stuart, as the Science Art Fellow at the Commonwealth Scientific and Industrial Research Organisation (CSIRO) – Australia’s premier scientific research and technology organisation, within Transformational Biology Capability Platform (TBCP) – now known as Data61. 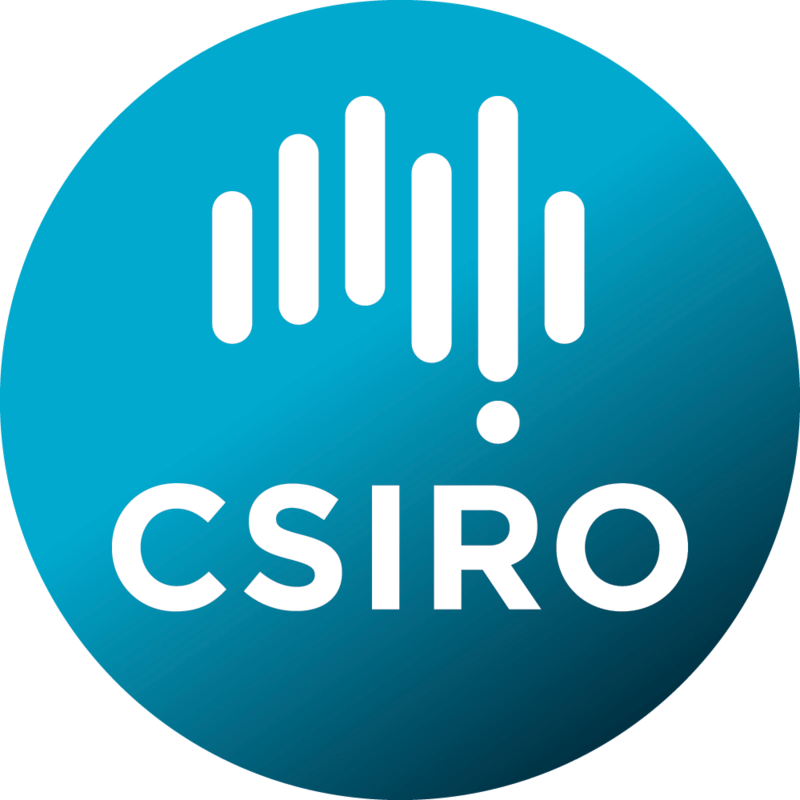 Based at the time at the CSIRO Mathematics, Informatics and Statistics (CMIS) Research Division, then supported by Dr David Lovell, Bioinformatics and Analytics Leader, and Dr Matthew Morell, Theme Leader, CSIRO Food Futures Flagship. The final work was shown at the Questacon – The National Science and Technology Centre and the CSIRO Discovery Centre. *Read more about this on the StellrScope Website. The StellrLumé Domes installation uses Spatial Augmented Reality (SAR) techniques to bring computer graphics into the human-scale physical environment. In order to facilitate interaction between the graphics and visitors, overhead depth cameras are used that sense red, green and blue as well as distance for every pixel. 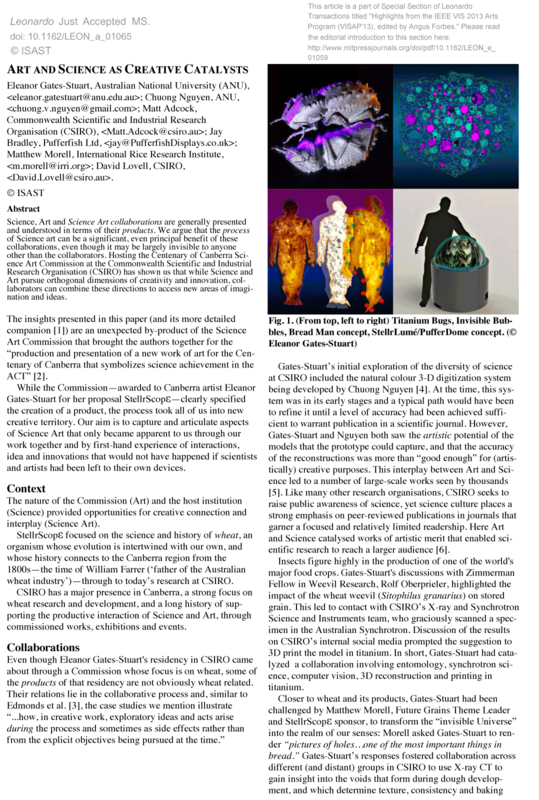 Custom software then extracts the human form, such as hands, over the top of the projection surface and elements of the digital content (video images) are selected and shown based on where ‘virtual shadows’ land and a composite video is projected through a fish-eye lens onto the dome. This gives us a two-layer, 2D video on a 3D surface. A series of 3D Printed Titanium Insects are a result of researching the weevil insect as part of the StellrScope Wheat Science Art Commission at CSIRO. Creating the 3D insects brought together expertise across CSIRO, including the Australian National Insect Collection, Computational Informatics and Future Manufacturing. The insects were achieved by advanced scanning techniques and X-Ray Phase Contrast Scanning. 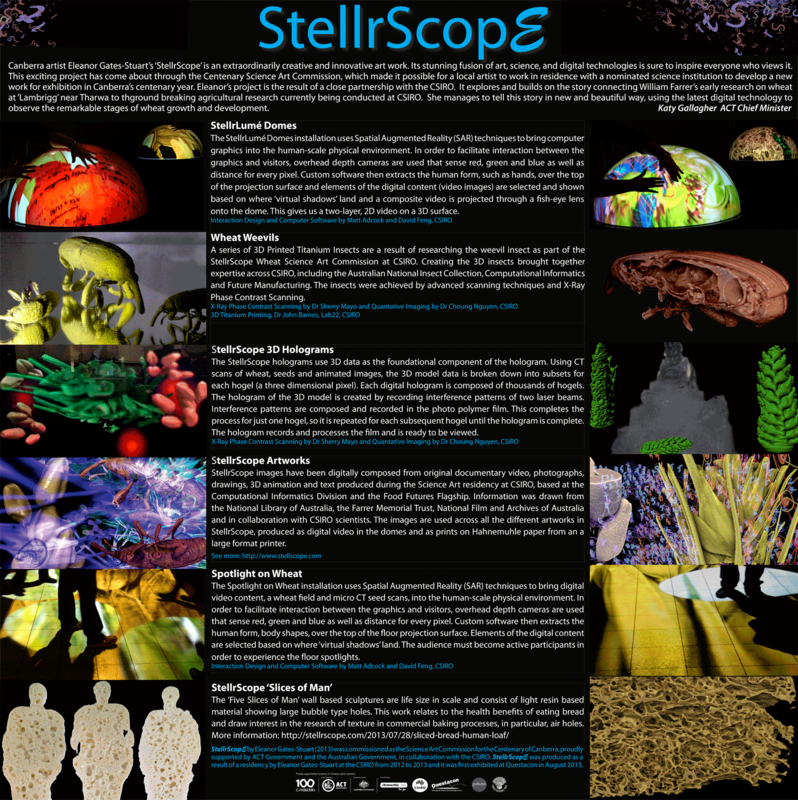 The StellrScope holograms use 3D data as the foundational component of the hologram. Using CT scans of wheat, seeds and animated images, the 3D model data is broken down into subsets for each hogel (a three dimensional pixel). Each digital hologram is composed of thousands of hogels. The hologram of the 3D model is created by recording interference patterns of two laser beams. Interference patterns are composed and recorded in the photo polymer film. This completes the process for just one hogel, so it is repeated for each subsequent hogel until the hologram is complete. The hologram records and processes the film and is ready to be viewed. 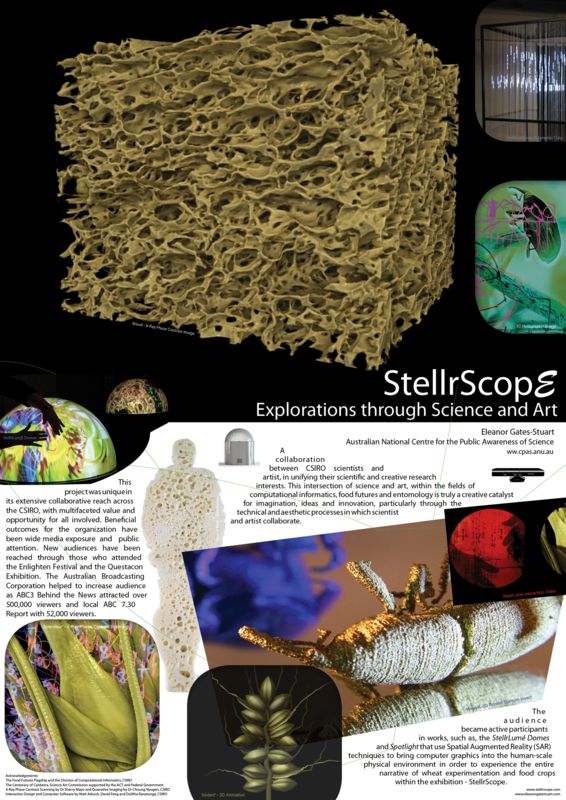 StellrScope images have been digitally composed from original documentary video, photographs, drawings, 3D animation and text produced during the Science Art residency at CSIRO, based at the Computational Informatics Division and the Food Futures Flagship. Information was drawn from the National Library of Australia, the Farrer Memorial Trust, National Film and Archives of Australia and in collaboration with CSIRO scientists. The images are used across all the different artworks in StellrScope, produced as digital video in the domes and as prints on Hahnemuhle paper from an a large format printer. 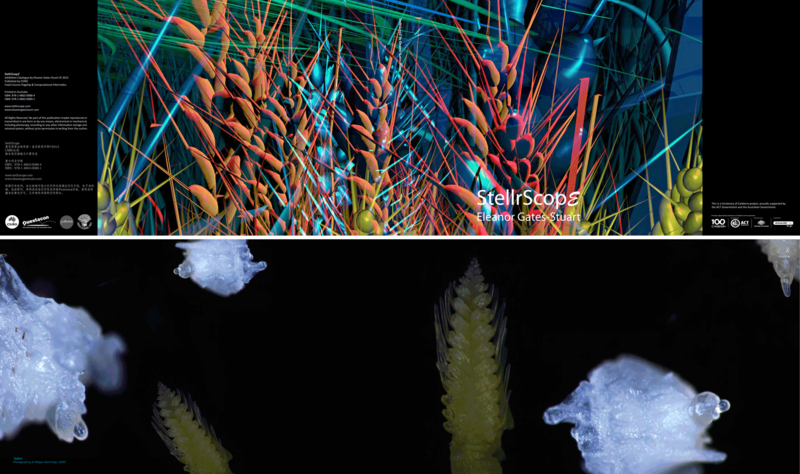 The Spotlight on Wheat installation uses Spatial Augmented Reality (SAR) techniques to bring digital video content, a wheat field and micro CT seed scans, into the human-scale physical environment. In order to facilitate interaction between the graphics and visitors, overhead depth cameras are used that sense red, green and blue as well as distance for every pixel. Custom software then extracts the human form, body shapes, over the top of the floor projection surface. Elements of the digital content are selected based on where ‘virtual shadows’ land. The audience must become active participants in order to experience the floor spotlights. All Rights Reserved. No part of this publication may be reproduced or transmitted in any form or by any means, electronical or mechanical, including photocopy, recording or any other information storage and retrieval system, without prior permission in writing from the author. Robyn Archer, Creative Director of the Centenary of Canberra, first viewing of the StellrLume Domes (StellrScope Science Art Commission) with artist, Dr Eleanor Gates-Stuart at Questacon. The interactive domes respond to hands held over the dome to reveal a secondary visual narrative of the wheat story. The image on this StellrLume Dome shows 3D visualisation and Micro CT scanning of bread revealing the air hole structure in bread and documenatary footage of CSIRO wheat fields. Other content is drawn from archives from the National Library of Australia, National Film & Sound Archive, the Farrer Trust, CSIRO and artworks. All works on this site must not be reproduced or copied without permission and/or acknowledgement. Contact page for requests.